The large, ground-active agelenid Coelotes terrestris is abundant in coppiced chestnut woodland in Blean woods NNR, Kent (Russell-Smith & Swann, 1972) where it spins tube webs in the stools of coppiced chestnut trees (Castanea sativa Mill.). During the summer of 1971 a number of these tubes were investigated by carefully excavating the surrounding soil over the complete length of the tube which in several cases was found to be branched. In many, although not all of the tubes, accumulations of what appeared to be the discarded exuviae of prey items were found close to the rear end of the tube. From 10 of the tubes these accumulations of remains were removed to the laboratory where the individual prey items were carefully disentangled from enmeshing web and fungal hyphae under a stereo microscope and then counted and identified. The results of these investigations are set out in the table. The numbers of prey items in each tube varied considerably from 3 to 33 with a mean of 17. The most abundant single prey item was the wood ant (Formica rufa L.) which accounted for 68% of the 172 items identified. This species is one of the dominant ground-active arthropods during the summer months in Blean woods. Coleoptera accounted for a further 17% of prey items and included Staphylinidae, Curculionidae, Elateridae and the carabids Notiophilus biguttatus and Abax parallelipedis. The remaining prey items included Diptera (Tipulidae & Borboridae), unidentified Hymenoptera, Diplopoda (7 Cylindroiulus punctatus and 2 Polydesmus sp. ), Isopoda (2 Oniscus asellus), an unidentified opilionid and one spider (Dysdera sp.). There were also the carapaces of 4 Coelotes among the prey items but these may have been moulted by the occupants of the tubes. The extent to which these figures are representative of the prey of C. terrestris is not clear. They will obviously be affected by whether or not all prey items are accumulated in one place and also by the rate of decomposition of the more soft-bodied prey species. This could be checked by feeding known numbers of prey to spiders kept in the laboratory. If the figures are representative it would be possible to assess feeding rates for this species in the field in the same way as for orb-web weavers. It is clear however, that the wood ant forms an important item in the diet of Coelotes in this woodland. Some of the other prey items were unexpected. The carabid A. parallelipedis is bigger than Coelotes and armed with powerful jaws. 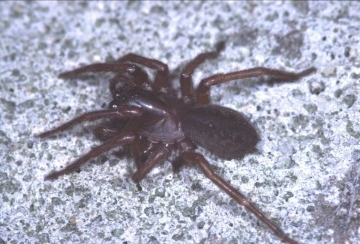 Bristowe (1941) has suggested that millipedes and woodlice are unpalatable to most spiders with the exception of Dysdera spp. which regularly feed on woodlice. Although they only form a small part of the total prey taken the crushed state of the remains of both the woodlice and millipedes suggested that they were actually eaten rather than simply discarded after killing. Bristowe, W.S. (1941) The Comity of Spiders Vol. II. Ray Society, London. Russell Smith, A. and Swann, P. (1972) The activity of spiders in coppiced chestnut woodland in southern England. Bull. Brit. Arach. Soc. 2(6) 99 - 103.